Denis O’Sullivan joined the Blues in 1965, the first year of Ron Barassi’s tenure as captain-coach of the Blues. A local lad from Melbourne’s northern suburbs, he had begun his football career at Coburg YCW, before moving on to Batman, then Essendon Under 19’s. Although he had been cut by the Bombers after just one season in 1964, O’Sullivan believed that he was good enough to play senior VFL football. Therefore, the next year saw him at Carlton, where some good showings in the pre-season practice matches won him a place on the Blues’ list. He had played mostly as a rover-forward to that point of his career, but when he was sent to the back pocket in the Reserves, he found his niche. After a string of eye-catching games with the seconds, O’Sullivan became the 12th Blue to wear guernsey number 35 in a VFL match when he was called into Carlton’s senior team in round 9, to enjoy a big debut win over Fitzroy at the Brunswick Street oval. Another good victory followed in round 10 at Princes Park, when the Baggers accounted for Footscray, but the following week he was relegated to the bench before the Blues went down in a thriller to St Kilda in their first-ever clash at Moorabbin. Thereafter, O’Sullivan played out the year at the lower grade, showing consistent good form without earning another chance at the top level. Despite being a clear winner of the Reserves Best and Fairest award, he was delisted at season’s end. Denis died suddenly at home on May 16, 2018 and was aged 72 years old. 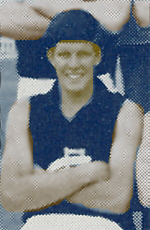 During seasons 1963 and '64, O'Sullivan was occasionally called in as a "top-up" player for Carlton Reserves. On those occasions, he wore guernsey number 53. Contributors to this page: WillowBlue , Jarusa , PatsFitztrick , pblue , Bombasheldon , molsey , tmd1 , true_blue24 and admin . Page last modified on Saturday 19 of May, 2018 08:54:12 AEST by WillowBlue. 1982 - Wayne Harmes the boxing referee (29/05/82). The Legend of 1970 Lives on (19/07/95) pg 2 of 2.